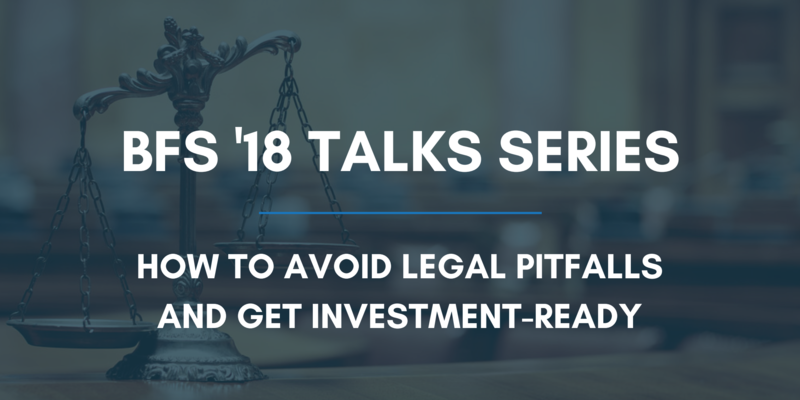 The speakers outline three things you can do to avoid legal issues and make your company more attractive to investors. Do an internal health check. Utilise the EIS/SEIS tax schemes. Before you get involved with any investor, perform an ‘internal health check’ on your business and look for any problems that might come up in the due diligence process. What does this check entail? A City Law Firm provides a basic checklist of the main aspects of your business you’ll want to review before looking for an investor. You’ll want to have thought through each of them - and have the paperwork to show it. The goal is to prove to investors that you are ‘transparent and organised’. The lawyers at A City Law Firm often encounter co-founders who have not taken the time talk out their plans and goals for investment. What kind of investment do you want? How much? What else might an investor offer that’s important to you? What do you ultimately want to do with this company? Make sure all co-founders are all on the same page! One crucial but often neglected decision that needs to be discussed is how much control (in the form of equity) you want to give away to the investor. Opinions on this can vary greatly from one entrepreneur to the next. Some are happy to give away more control for greater support, while others are reluctant to give up 50% equity and risk being eliminated from their own team. Might your team be divided on this issue? Get these in order and be prepared to show them to investors. There are many different ways to value a company. If you want help on this, seek it before you go to the market. No matter your method, however, the most important consideration is whether you can justify your valuation. You need documentation of your business’s history, sales (if applicable), financial projects, income streams. Without that, investors will have to assume you’re plucking a figure out of thin air and be sceptical of you. Your employees and subcontractors have your confidential information, will potentially develop intellectual property for you, and are likely the backbone of your business. For these reasons, investors need to know that you have contracts and all other necessary documentation in place for them. No one wants to invest in a company whose people and confidential information might be given away to competitors. Pay especially close attention to whether your people are your employees or self-employed subcontractors and the legal implications of each possibility. IP is the collateral you offer to an investor. If you leave the business or it fails, what they have left to profit from is the business’s IP. Have you registered your trademarks - in the right classes and the right jurisdictions? Do you have a full portfolio to show them? Make sure your designers, coders, graphic designers have signed over all the IP that they have created to the business; this be transferred only in writing. The founders themselves often create their IP and forget to assign it to the company upon corporation. Investors want the IP to belong to the business, not to the founder, so make sure to transfer those rights. Many young companies skip the expense of creating staff handbooks or other policy documents. But without well-developed policies in place, you’ll start off on a bad foot with investors and be legally vulnerable. Once you’ve done your internal health check, consider EIS and SEIS, one of the best incentives for investors to put their money into your company (other than the potential of the business itself, of course!). The government has two schemes to actually encourage investment in new businesses. For companies under two years old, there’s the Seed Enterprise Investment Scheme (SEIS), which provides generous tax relief on 50% of the money invested. This means that a £10,000 investment will cost them only £5,000. They might also receive capital gains tax relief benefits. A company can only raise £150,000 of SEIS money in its lifetime. Since each individual can only invest £100,000 of that, you might raise £50,000 from three people, £100,000 from one person and £50,000 from another, or some other combination. If your business is too mature for SEIS or otherwise doesn’t meet the requirements, look into the Enterprise Investment Scheme (EIS). EIS differs from SEIS in a few key ways. Each investor can invest up to £1 million, and the company can raise up to £5 million per year, a significant increase from SEIS limits. However, investors will get back only 30% of the money they invest. In other words, a £10,000 investment costs them £7,000. If your business qualifies for EIS or SEIS, Stovold says, definitely look into it. There’s a good reason why most companies on equity crowdfunding or angel platforms are EIS- or SEIS-ready: it’s one of the best ways to encourage investors to part with their money. If you’re seeking your first round of investment, you might think it’s too early to plan your exit. You’re just getting started! However, investors want to know how they’ll get a return on their money. Showing them a realistic strategy for this will make you a much more attractive business partner. Having an exit plan also protects you, the entrepreneur. You can’t protect your interests if you don’t know what they are, and the investment terms you agree to now could prevent you from securing the future you want. For example, if your exit plan involves selling the business, you’ll want to avoid ending up in a position where you need the investor’s approval to do so. a partial exit, which is often a large investment that allows the founder to realize some cash out of the business. a full exit, meaning the sale of your business. This will involve selling the assets of the business or selling all your shares in the company. The company might be being sold to a competitor, to a company in a complementary market, or to a management team. an initial public offering (IPO), which puts the company on the stock market. This is costly and requires a lengthy series of investment rounds. The path you aim for will partly depend on how long you’re willing to commit to the business and your desired post-exit role in the company. Aside from making money, what does the end of this journey look like for you personally? Perhaps you want to remain in an executive role for as long as possible or stay on as a consultant. Perhaps you want to try working on a new venture or in a different sector. Or perhaps you just want to retire by 40 and sit on a beach for the rest of your life. Any answer is fine as long as you know your intentions and let investors and your co-founders know them, too. Learning too late that everyone’s goals are not aligned can lead to disaster. Securing investment can seem like a game of connections and timing, but the strategies covered in this talk demonstrate that a substantial portion of your business’s fate is in your hands. Do your research and seek expert counsel when you need it; there are many specialists in law, tax relief schemes, and business strategies for SMEs. Following the tips given here, and you’ll be confident that you’ve taken some of the most important measures to ensure your own success and make your business as investment-ready as possible. Stay tuned for more coverage of our full day of panels and talks to get expert advice on making the most of intellectual property, raising for a tech business, securing grant funding, and more.